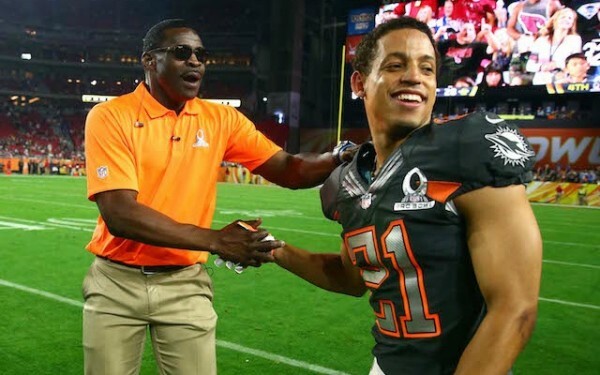 Two recent stories – one regarding the docked pay of Brent Grimes for going to visit his sick wife instead of practicing for the Pro Bowl and the other suggesting the NFL is trying to expand its playoff at the expense of college football tells us what we already know: Roger Goodell is running the most disgustingly greedy sports league in the world. We begin with Grimes, playing in the Pro Bowl for a third time. He missed the Thursday practice because his wife had emergency oral surgery, at least according to him and her. Due to some miscommunication (or maybe there was none), Grimes was stripped of his paid appearances due to missing practice. The result? Miko Grimes, his wife, going off on Twitter against the league. For taking his money, and for not making him the defensive MVP. He did have a beautiful interception in that game. But that’s chump change. Peanuts. Goodell loves taking peanuts from his employees. According to a recent GQ article, the man making $44 million for running this cruise ship for 32 greedy owners, thinks everyone in the NFL office is overpaid. Or at least anyone not important enough for him to care about. The NFL wants to expand the playoffs; 16 teams instead of 12. That means an extra day, and that means expanding to Monday. Alas, Monday, at least for the next few years, during the time the NFL playoff games takes place, belongs to CFP, with all of the games on ESPN, and playing the national championship game on Monday. Part of the idea is having the back to back triple header on December 31 and January 1, which includes the semifinal games. Right now, ESPN is trying to pressure the CFP committee to move the date of its game. The NFL is doing the same, directly and indirectly. The NFL sees itself as a titan among a field of ordinary men, regardless of the amazing ratings, the highest ever for cable programs, that the college football playoff games drew. The NFL is an elephant in a china shop. If the off-the-field dealings early this season didn’t turn off the blind hordes from watching or at least showing less interest in the NFL, why should this aggressive expansion type of behavior stop happening?